Working in HVACR includes working on heating, air conditioning and refrigeration systems in businesses, homes and any other area that utilizes a system to sustain quality air control. However, beyond the basic definition, there are many variables that come with the position of HVACR Technician. From extreme temperatures to confined spaces, here are just some of the different environments you should be prepared for should you choose to enter the HVAC and Refrigeration Technician field. Large walk-in coolers in restaurants, stores, schools, florist shops and manufacturing plants are, understandably, cold environments; that is if a technician is conducting routine maintenance tests and the system is working properly. If the walk-in cooler is performing at a warmer temperature than normal because of a faulty part or lack of refrigerant, it won’t be as cool inside the work environment. 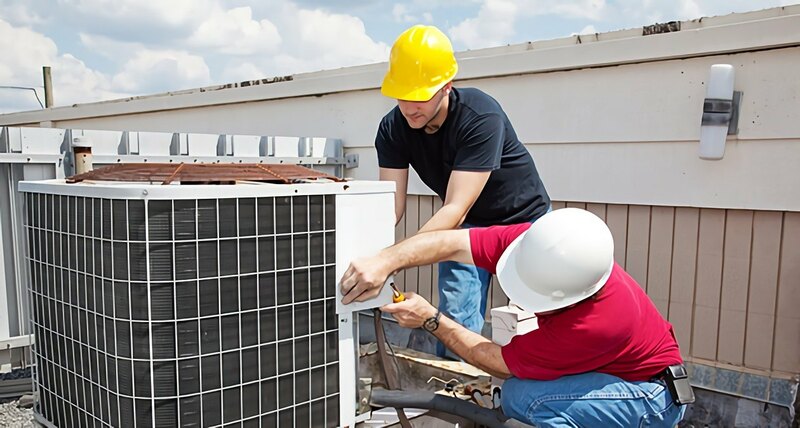 Some hands-on HVACR training includes outdoor work, which can be extremely hot or cold depending on the climate in the area of repairs, and the season. Residential cooling units are often outdoors on the ground. Businesses in tall buildings generally install cooling units on the rooftop. Rooftop access is from an elevator to the roof or may involve climbing a ladder on a one-story building to access the unit for service. Attending a refrigeration school can help give a student the skills, knowledge and training for a certification in HVACR. Some of the work environments may be in very cramped situations when repairing or maintaining equipment in small areas, such as indoor heating units in a closet or enclosed area. A technician in training gains knowledge of specialized tools to gain access to the area he or she is maintaining, testing, or repairing. Some work environments are not only hot or cold, but also very dark. Heat pumps that install in residential attics require climbing the small attic staircase and entering the attic. Attics may typically have no or little lighting available and can be dangerous when walking in dim lighting. Attics may have solid wooden floors, which can make walking easier, or only have wooden support beams to walk on. A step in the wrong direction in this type of attic can send a HVACR technician through the ceiling, cause damages, and possible injuries. Mobile repairs on heating and air conditioning systems include refrigerated and heated trucks for transporting goods over long distances that would otherwise spoil if it were at an incorrect temperature. These types of large trucks have an exact temperature to maintain for the goods they carry. This work environment is usually dark inside of a truck and can be hot or cold depending on the system that is being repaired. The area near the heating and cooling system may need to be cleared out prior to starting work to gain access to the unit. CarreerFactSheet reports that HVACR technicians can specialize in one particular area of expertise, such as geothermal heating and cooling systems, commercial refrigeration, solar panels or boilers that are gas, oil or water-based. Solar panels are generally installed on a roof or a tall structure and require a ladder to reach them for maintenance, testing and repairs. The HVAC education is more specific if the technician is specializing in a category that is not mainstreamed and involves learning how solar panels are connected, how they operate and how to trouble-shoot them. Geothermal heating and cooling is an extensive network of a water pool or lines underground filled with water that is heated by a heater, goes through a heat exchanger and produces warm water for some applications and cold water for others in a home. The lines that carry cool, hot air, and water run throughout a home and involve accessing them in the walls through access doors for repairs in the most common areas where repairs could be needed. HVACR technicians can encounter any number of work environments depending on what type of system that needs installing, repairing or maintenance. A technician may be outside in the heat for one call and then go immediately to a second service call that is in a walk-in cooler. Technicians should be versatile in temperature changes, carry a jacket and flashlight with them, and observe all the EPA guidelines when working.